ELI is meant to equip students with the skills they need for their professional and personal lives. 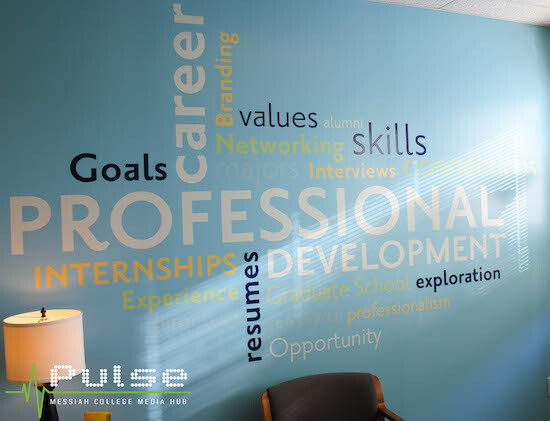 A wall in the Career and Professional Development Center depicts some of these key words. This fall’s incoming class of first-year and transfer students will take part in Messiah’s Experiential Learning Initiative (ELI) by graduation. ELI will require every first-year and transfer student to complete at least one of five experiences before graduation. The five experiences are internships/practica, service learning, off-campus programs, leadership, and research. There are many members of ELI’s leadership team including Vice Provost and Dean of Students Kris Hansen-Kieffer. She says the five experiences are nothing new to Messiah. “Experiential learning has been a part of our fiber for a long time. This initiative ensures that all students will do that,” says Hansen-Kieffer. Students must have a minimum of 24 credit hours before choosing their ELI experience. The experience will be a graduation requirement, but earning credit hours for it depends on whether it is curricular or non-curricular. Assistant Dean of General Education, Common Learning and Advising, Robin Lauermann, explains the process. “If it’s curricular, it will be built in. Some things may be non-credit based, things like research and leadership will not be credit based because they’re co-curricular. You would register, and where it’s not already built in, it will have a zero credit option you can register for,” she says. Each experience has in-class and out-of-class components depending on the experience. Service learning is more curricular and requires a minimum of twenty hours outside of class, while the other four require a minimum of forty hours. “It’s likely that students will do more than one. A lot of our students do more than one. There’s nothing wrong with that, it only helps students more,” Hansen-Kieffer says. Students enrolled in an ELI experience will follow a step-by-step process to accomplish these goals. They will identify learning objectives based on guiding questions at the beginning of the experience. At the end, they will look back on their initial goals and reflect on what they learned. This reflection process will help students produce a “deliverable.” The deliverable is meant to showcase what they learned and why it’s important for their future goals. Some examples of a deliverable are a resume, an ePortfolio, website, poster presentation, etc. However, individual departments will determine whether or not an internship or practica is ELI-approved. Research can also be designated as ELI-approved by the individual student depending on his or her major. The ELI leadership team hopes this process will help students articulate how their experience prepares them for meaningful careers and community engagement. “A lot of the national data shows that when you just do something without being asked to think about it, that connection doesn’t always happen. It’s just the nature of the process. If you’re not taking the intentional time to say, ‘What am I getting out of this? How has this shaped me?’ You’re not going to articulate it,” Lauermann says. Each student will be assigned an ELI advisor to aid in the process. More information on ELI will be provided to all first-year students in Created, and Called for Community in the spring 2016 semester. To read more on the experiential learning initiative at Messiah College, check out: http://www.huffingtonpost.com/scott-willyerd/why-a-college-is-using-pr_b_7889676.html.